Apple has a new way for iOS developers to promote their apps in the App Store—but it comes with a price. 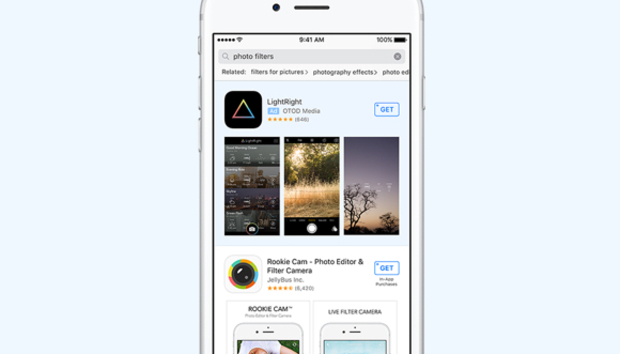 On Wednesday, Apple revealed that Search Ads will go live in the App Store starting October 5. The information came in an email Apple sent to app developers encouraging them to create an ad campaign to appear in U.S. search results. Developers who sign up will receive a $100 credit towards their first campaign. These Search Ads will give developers the opportunity to have their app be featured at the top of relevant search results. Developers can create Search Ads based on various targeting features—including popular search keywords, gender, age, and location—to get their app in front of the right people. There is no minimum spend, and developers will only pay if someone actually downloads their app. They will also be able to stop an ad campaign at any point. According to Apple, 65 percent of app downloads come directly from search results in the App Store. The company is hoping that Search Ads will help fuel discovery of lesser-known or niche apps. However, it’s safe to say that the Instagrams and Candy Crushes of the world will have bigger ad budgets than indie developers. So, Apple is focusing on relevance as a way to control big advertisers from taking over the App Store. “If an ad is not relevant to what the user is looking for, it will not be shown in the ad spot regardless of how much you are willing to pay,” reads Apple’s Search Ads page. The impact on you: Apple is also reaffirming its commitment to user privacy as they pertain to these new Search Ads. Users will only see one ad per search query at the top of the results. Furthermore, Apple promises not to track users based on their search queries or share individual user data with advertisers. In addition, developers and advertisers won’t have access to user data from other Apple apps like Health and Apple Pay. Children who are 13 or younger won’t be served Search Ads.